Watching The Long Ride Back to Scratchwood tonight, a familiar-looking face was standing in front of Terry and Justin James in a cafe. I have this episode on video, and my lack of technical knowledge (not to mention the required cables) forbids me from posting a screen grab, but the geezer was there alright, complete with shades and more hair than usual. Aitch will be glad he wasn't the poor sod on the bike Arthur nearly ran over - it looked a lousy day and the luckless cyclist landed in a squelchy pile of mud. I hope for his sake they did it in one take. 'Scratchwood' featured a classic line from Justin. On glimpsing the customised van that's to transport them to Scotland, Justin exclaims: "That's a bit tasty, Tel - the old shagwagon!" I watched that episode last night too off my DVD. Great stuff. I'm sure it's Harry in the cafe. It's in the scene at the beginning of the episode after Terry bumps into Justin in the street when the latter is trying to get a cut-price apple from the fruit & veg shop. The owner tells Justin to beat it. Scratchwood is a classic. Justin was well funny - didn't Arthur call him Justine? Justin in one of the most 80s looking people ever with his blonde highlights and 80s fashions - such as his v neck golfing jumper with logo, and light grey leather jacket. The henchman said he had a "poofy quilt"! This is a great episode but by the end I think it just fails to deliver on the spark that it promises throughout. The conclusion is ok but I've always thought it could have done a better job resolving the excellent build up. What's funny in this one is that they (the vehicles with Derek Martin at the left hand drive wheel) clearly drive and are seen around Birmingham, but the services at the end are back down in West London in Heston, M4 Westbound. The services are right alongside Chisholm's new job location from 'An Officer & A Car Salesman'. I have the feeling that George and Dennis really didn't venture north of Watford into bandit country! Particularly fond of Justin's mum in this one; proper working class bird, was she ever in the Sweeney? Of course! She's in the marvellous Messenger of the Gods, a very Minderesque episode of the Sweeney. I see Derek Martin every couple of weeks and on Sunday I told him about the passing of Mark Farmer. He didn't know, and wanted to know what illess he had etc. He said he pulled his duvet off in the scene etc. I said yep! Your bang on there, Justin had a Lacoste jumper and Lois cords on, proper casual. A mate of mine was an apprentice at Brentford at the same time as they filmed there, March 1984. I like the scene in the service station where Alisdair loses his rag with Justine and says he's a civilized man, an accountant, who doesn't do things like beating people in toilets. Cue Justine's anguished cry of "Then stop!" I agree with jno on this one. A marvelous build up but the the episode just sort of peters out. A fine episode until the last few minutes. Yup, Justin's mum's proper tasty (can I say that? Oh, sorry). Didn't realise til Terry said it in this ep that 'bristols' is rhyming slang: Bristol Cities...Great line from Arthur too: "When I hear the word 'honest', I reach for my solicitor" which sounds ironic coming from him. Not only that, but he's paraphrasing Mussolini - "When I hear the word 'culture', I reach for my revolver". Yes, the ending's a bit rushed (telescoped in the editing suite?) but Terry rescues it with his gardening quip which ties it up nicely. And is it me, or are the earlier eps of this series a bit dark (video transfer)? Still laughing at my bestowed Syrup avatar, BTW. And in the pub afterwards is a great scene…one of my favourite Minder pub scenes…”it was going alright an’ all until they rolled your annual tax return…” Great Terry and Arthur sequence here. I hope The A Team gave Arthur a used vehicle warranty with that van ! - from the Starsky & Hutch era ! It did look like Forgeham, in the cafe, and I kept thinking he might come into it. I too spotted Brentford's ground. I like it, it was a good episode but was disappointing because it could have been so much better. Give it a two parter. Could have been a real cracker..
Those that think the ending was a let down, you're right, it was for me too. By the way where are Terry's fights in this series. I wanted him and Derek Martin to have a ruck. Very good episode, but have to agree that it peters out. 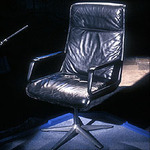 First time I saw this one was the ITV afternoon repeats in summer 2000. I'm not sure if UK Gold showed it as I recall most other series 5 episodes from then. Another who thought the bloke was John Forgeham. Justine(e) was a great character, who could have been annoying but the writing and the late Mark Farmer keeps him the right side of likeable. This is so correct Arch. The thing that separates this between a classic 'excellent' episode and an above average comedic affair is a decent punch-up at the end. Interestingly a slimmed down younger Derek Martin plays a heavy called Paddy in the 1970 series of Paul Temple (covered extensively elsewhere on the forum ( minder.proboards.com/thread/2147/paul-temple-1969-1971 ) and often steps in to help Paul Temple when there are any fisticuffs on offer. Martin also jumps out the back of a van in 1.5 'The Bounty Hunter' too. I am sure that a good punch up would have been well within Martin's range even in the mid 80s. Just watching this on ITV4. Justin "numero uno". Makes me smile every time. Sensitive ITV4 edits update - The quilt with which Derek Martin's character threatens to smother Justin is no longer "poofy". The scene remains but the audio has been edited. "I'm gonna smother you with your quilt"
That's one of the best lines! I'd agree with what's been said so far, a great build up but fizzles out at the end. Still well worth a watch though. Totally agree ltd, what this one needed was Benson to still be bent, but an 'In' style punch up with Derek Martin's character Cedric and one other rucking it out with Terry at the end. In the ensuing fisticuffs, any money or tickets end up in a river or simply flying off in the wind. Alternatively, a Scottish firm could have appeared while Terry was scrapping with Cedric, tooled up, they simply take everything from all of 'em as they're clearly all north of Watford and well outside their comfort zone. I'm no scriptwriter but something like that was needed to round it all off it in a much better way. It's too bad this one runs out of steam so obviously in the final minutes because until then it's a very good episode. I had forgotten about the way Justin runs at the mouth and treats Arthur like he's Don Vito Corleone. Justin is another in the long line of great characters to appear In Minder and it makes sense he would return. He was a good actor for the part. Tragic he died so young. 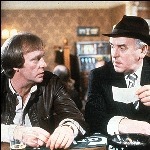 A nice contempory style episode of Minder. My new favourite episode because it features Old Wembley Stadium. I clicked on the idea in the storyline that how fans had to purchase tickets via mail order because of Scotland. 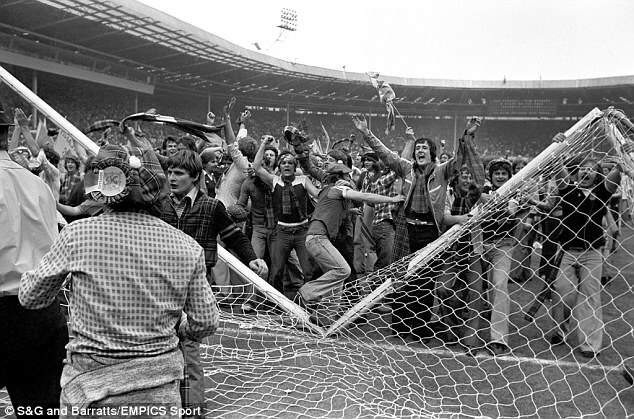 This was because in 1977, Scotland invaded the pitch at Old Wembley and snapped the crossbars and ruined the turf after the 2-1 win against England. So Scotland has been tagged ever since for their style of celebration ever since but the idea they had to sell ticket via mail order, I don't know if that is true but it does fuse a good premise to make the story work in this episode and include a bit of history of Old Wembley. Here's the photo I got from the daily mail showing the situation at Old Wembley showing that this happened. I'm sure many here knew this.